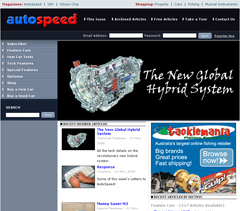 Advertising on AutoSpeed is an easy, flexible and effective way to promote your business, product or service. With a truly international readership, we can target your message accurately, ensuring it reaches the best audience and provides a positive return on your investment. With a huge readership every month of well educated, high income enthusiasts, AutoSpeed can tailor a package that suits your marketing strategy and budget.